In the 2014-15 season David Blatt coached the Cleveland Cavaliers to a 53-29 record, despite not having Kyrie Irving, their star point guard, for much of the season. He then led them to the playoff finals, despite having a limited Irving and losing Kevin Love, their star power forward and even had them leading the series 2-1. Ultimately the much stronger Warriors overtook the Cavaliers and won the series 4-2, but the Cavaliers, despite being clearly undermanned, battled all the way. During the offseason there was tons of speculation regarding Love’s return to the team and ultimately he signed up to play the third slot in the so called “triumvirate” of stars needed, a’ la’ the Miami Heat, to win the NBA championship. There was much discussion regarding Love’s and Lebron James’ relationship, somehow they came to a meeting of the minds and continued their playing relationship. What was more interesting regarding the Cavalier offseason was what next took place. Apparently the “King”, as Lebron refers to himself, wanted Tristan Thompson to continue to be a member of the Cavaliers. An average player at best, in 2014-15 Thompson averaged 8 points and 8 rebounds a game, but as Lebron indicated in an October 3rd instagram posting of him and his buddy, he considered the contract negotiations a “distraction” to the team and wanted them settled. Lebron, of course, got what he wanted, as Thompson signed a 5 year 82m contract. So far, he is averaging 7.6 points and 9.4 bounds, pedestrian numbers at best. Let’s fast forward to this past week as the Cavaliers were sitting at 30-10, despite neither Love nor Irving looking like their old selves and the Cavs were blasted by their playoff finals nemesis, the Golden State Warriors. No big surprise there, the Warriors have been killing everybody with a beautiful team with tons of versatile players led by last year’s and most likely this year’s MVP, Stephen Curry. So what immediately follows? The firing of Blatt, despite his 2 year success, a move unprecedented in NBA history, no one with a comparably successful record had ever been fired. Here’s where you see the presence of Lebron behind this whole scenario. The Cavs announced that Tyronn Lue, a Cavalier assistant coach, would be Blatt’s replacement. Standard operating NBA procedure would be to slap an “interim” tag on Lue and depending on his results, make a decision on his future after the season. Instead they signed him to a 3 year contract, something I have never seen offered to a replacement assistant coach in all my years of watching pro hoops. No doubt, this occurred to appease Lebron, who has a strong relationship with Lue. 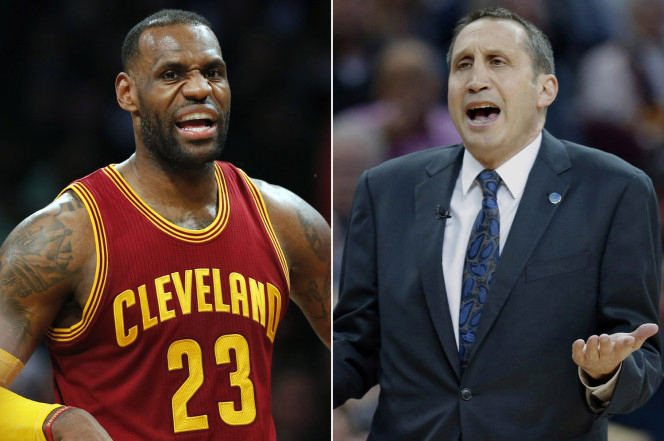 The outcry around the NBA regarding Blatt’s firing has been widespread. Stan Van Gundy, Greg Popovich, Byron Scott and others decried the move. Lebron was quoted as saying “he was surprised and caught off guard” regarding the firing. This is the biggest bunch of bull…. I’ve heard recently, their relationship was never on firm ground. Lebron, with his ridiculous departure from Cleveland going back, his dealing with Wade and Bosch to set up the Heat and now this disgrace indicates the ridiculously oversized influence the “King” has on the NBA. Assuming the Cavs make the NBA finals, will Lue get fired after the Warriors kick the crap out of them? I’m extremely interested to see how this all plays out! This entry was posted in Sports Depot. Bookmark the permalink. Copyright © 2013 SPORTSDEPOT.COM All Rights Reserved.